Things were clicking for Andrew Wiggins in Brooklyn. Though he’d normally been quiet until the second half, Wiggins opened the game aggressively, pouring in 9 points before halftime. The third quarter, usually Wiggins’ element, was still there for him even after his strong early play. He took it to the basket, nailed a jumper, and put one in from long range. For the first time in his short NBA career, Andrew Wiggins was in the zone. Then, driving to the basket, he was fouled hard by Jarret Jack. It was a dangerous play—though it wasn’t ruled a flagrant, it easily could have been. Wiggins hit the floor hard, and got up quick. At this point, most NBA players would be pretty fired up. Many would get in Jack’s face, or do some push-ups, or just generally act fired up. But Wiggins stayed placid. You would’ve thought it was just any old shooting foul. He didn’t react. When he came out of the game later in the third–with a career high 17 points–his face was a mask. Much has been made of Wiggins’ psyche by analysts. They say he lacks the “killer instinct”, that his play is too passive to succeed. He’s not made of the same stuff as Kobe or Jordan. He simply lacks something that can’t be taught. But this story is too simple. For one, the college game was never going to show off his true talents—these same criticisms were lobbed at Kevin Durant when he played his lone collegiate season at Texas. And Bill Self’s offense at Kansas may not have been the best fit for Wiggins (or indeed for any one-and-done NBA prospect). But, to my eye, Andrew Wiggins stands out as a unique case of tantalizing ability. He has a problem both profound and fixable, something rarely talked about in regard to professional athletes. In a league of extroverts and attention-hungry stars, Wiggins is a shy kid who suffers from performance anxiety. That’s not a term that gets tossed out a lot around the NBA. If anything, you might hear talk about “nerves” for a rookie in his first couple games, or a young player in his first big playoff series. But these issues usually get brushed off as temporary problems, things to be powered past or dealt with by playing a few more games. The truth is, it can be a much bigger deal than pundits seem to realize. As someone with experience in a high-stress, highly competitive environment (classical music auditions, which often host dozens of candidates and require near-perfect performances), I can vouch that performance anxiety is a big deal. Everyone in that type of setting has dealt with it at some point. Some people eventually learn how to successfully channel it; others never do. In the field of classical music, people turn to medication: Beta blockers, which help negate the effects of adrenaline, are essentially ubiquitous. Musicians and athletes aren’t the same, but the point is that nerves can be a bigger deal for those dealing with high-stress situations that you might think. It does happen in basketball—Bill Russell threw up before almost every game he played. It wasn’t from bad food. And Dwight Howard’s struggles at the free throw line? There’s a reason he hits them so much more easily in the gym, and it’s not just game fatigue. For Dwight, repeated negative experiences on the court with free throws have impacted him negatively–and the “Hack-a-Dwight” strategy only served to increase the pressure he put on himself. Though we can’t get inside Andrew Wiggins’ head, he is a model case for someone who suffers from nerves. He’s clearly a shy kid; he’s not at all someone who seeks out the spotlight, and though he doesn’t seem uncomfortable with attention, he doesn’t thrive on it either. As Dwight’s struggles show, nerves can hit even the most gregarious player, but a guy like Wiggins is a prime suspect. You won’t necessarily see him shaking on the court, but there are undeniably some stretches where Wiggins isn’t going at it with the puissance his athletic gifts grant him. Maybe Wiggins really does have a problem with aggressiveness, and the nerves are just an excuse. But it’s easy to mistake nerves for being uninterested. 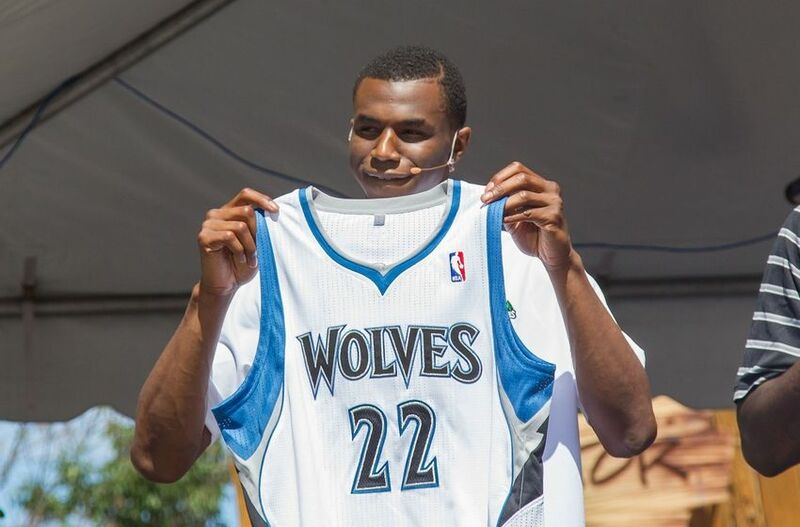 Even Flip Saunders has gotten on Wiggins about it. “Everyone knows when he was at Kansas, people thought that he floated at times,” Saunders said. “So our assistants on the bench, if we see him floating, we are going to take him out.” Wiggins has come through in key moments on defense. Maybe he gives so much effort on defense that he drags on offense. Maybe he simply feels more comfortable on defense and feels more nerves taking shots. It’s impossible to know with certainty, but it is quite interesting to hear Flip’s take it on it, and one wonders how open Flip is actually being about Wiggins’ mental state. The good news for Wiggins fans is that nerves are something that can absolutely be dealt with. They do improve with exposure (more games played), and there are any number of ways a person can start to get them under control. As Bill Russell’s story demonstrates, the key is not necessarily to eliminate nervousness, but to channel it into something great. Along these lines, many great competitors speak of being driven by a fear of failure, or of losing. In the end, it’s not about fearlessness, but about owning the fear. But conquering anxiety and nerves will require attention and self-confrontation. And since nervousness is at best overlooked and at worst stigmatized in basketball, it may be hard for Wiggins to deal with head on. But he has all the tools to succeed. Like Dwayne Wade reportedly said to him, all he’s got to do is “Go hard if you want to be great.” Sometimes, looking inside oneself can be an even harder task than simply playing the game. I’ve liked what I’ve seen of Wiggins so far. Put me down as absolutely optimistic about his future. At the same time, I can vouch for how detrimental performance anxiety. I was no all-star athlete, but I was leaps and bounds better in practice, on the playground, or in the vacant lot than I was in actual games. Like you said, nervousness is not the issue; it’s when nervousness overruns everything else. The key for someone with that affliction is to put them into positions to succeed and build their confidence. One other thing is toss into the ring – we’ve been doing personality typing stuff at work, re team building, and some people are just wired to feel in their zone when everyone else is doing well. Doesn’t mean they can’t produce like an All-Star, but the motivations are different. Telling them to simply shine without addressing how it helps the group is going to ultimately yield someone who floats, because they are just naturally tuned into the group and they have to understand how they fit in – how what they do makes everyone around them better. If this is true about Wiggins, my guess is that he’ll ultimately have a Rubio type effect on teams at worst – no super awesome stats but teams are just better with him out there. If he is to develop into a star, it will be because the coaches have figured out how to show him that his individual greatness is great for his teammates. He will naturally find the talent gaps of his teammates and fill them/cover them if possible. Flip needs to give him time (like 40 games or more) to simply learn his teammates, and then start schematically leaving an opening for a superstar at Wiggins’ position to fill. If his personality type is this way, he will only achieve greatness if it helps the guys around him – if Wiggins sees that his scoring aggressiveness helps LaVine and Bennett be their best for example. Right now Wiggins is probably trying to help out everyone by simply being in the right spot on offense. At heart he’s a people pleaser, so you’ve just gotta figure out how to present things, how to get him to honestly understand things.